Rapidly Solidified Neodymium-Iron-Boron Permanent Magnets details the basic properties of melt spun NdFeB materials and the entire manufacturing process for rapidly solidified NdFeB permanent magnets. It covers the manufacturing process from the commercial production of the melt spun or rapidly solidified powder, to the production and properties of both isotropic bonded Nd and hot deformed anisotropic NdFeB magnets. 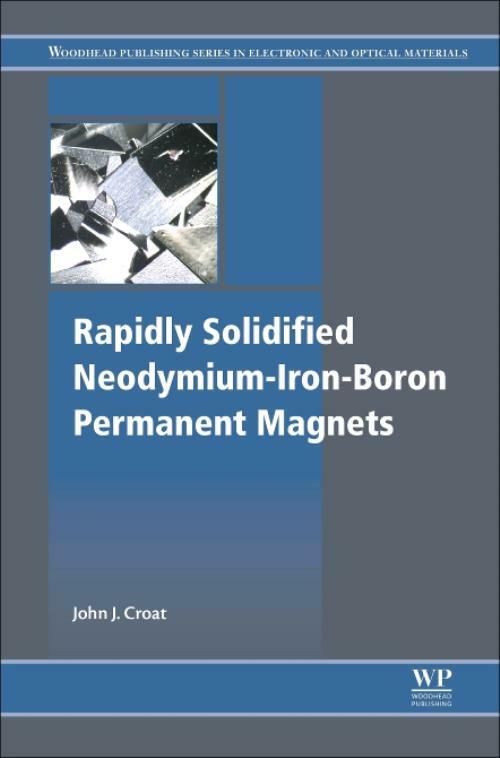 In addition, the book discusses the development and history of bonded rare earth transition metal magnets and the discovery of the NdFeB compound, also covering melt spun NdFeB alloys and detailing the magnetization process and spring exchange theory. The book goes over the production of melt spinning development, the operation of a melt spinner, the processing of melt spun powder, commercial grades of NdFeB magnetic powder and gas atomized NdFeB magnetic powders. Lastly, the book touches on the major application and design advantages of bonded Nd Magnets. Dr. Croat obtained a B.S. degree in Chemistry from Simpson College (1965) and M.S. (1969) and Ph.D. (1972) degrees in Metallurgy from Iowa State University. In 1972, he joined the Physics Department of the General Motors Research Laboratories, where he was involved primarily with research and development of permanent magnet materials from rare earth - transition metal alloys. While there, he was instrumental in the discovery and development of bonded NdFeB magnets and holds eleven patents in this area, including all of the US composition patents. In 1984, he transferred to the Delco Remy Division of General Motors to help start the Magnequench business unit, which was formed to commercialize NdFeB magnets. Between 1984 and 1995 he held various positions in this company, including Chief Engineer, Sales Manager and, from 1991 to 1995, Managing Director of the business. In 1995, General Motors sold the Magnequench business to a group of Chinese investors. In 1997 Dr. Croat helped AMR Technologies create a new NdFeB magnetic powder business. This division was named Advanced Magnetic Materials (AMM) and produced rapidly solidified NdFeB magnetic powder at a manufacturing facility in Nakhonratchasima, Thailand. He served as President of this company division until 2004. Since 2007 he has served as a consultant to the world-wide permanent magnet industry.